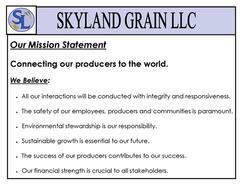 Skyland Grain LLC is headquartered in Johnson, Kansas and began operation August 1, 2004 with Johnson Cooperative Grain Co. and ADM Grain Co. as the founding parent companies. Syracuse Cooperative Exchange became a part of the joint venture on February 1, 2010. Cairo Cooperative Equity Exchange joined the joint venture May 1, 2015. 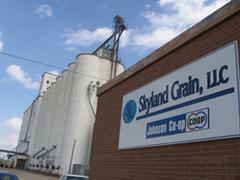 Skyland Grain, LLC operates locations in South Central and Southwest Kansas, Eastern Colorado and Northwest Oklahoma. The Kansas locations include Syracuse, Kendall, Big Bow, Johnson, Manter, Saunders, Elkhart, Dermot and Rolla. The Colorado locations include Walsh, Buckeye, and Vilas and the Oklahoma locations are Wildhorse and Hough. Cairo Cooperative Equity Exchange has been serving member producers in grain, fertilizer, seed, and fuel in nine locations across South Central Kansas for 100 years. Their current locations include Cairo, Cunningham, Preston, Turon, Penalosa, Brown Spur, Arlington, Waldeck, and Calista. By combining Cairo Cooperative Equity Exchange’s nine grain elevators with Skyland Grain’s eleven, they combine for a total licensed grain storage capacity of approximately 35 million bushels. Additionally, Skyland Grain LLC has a full-service agronomy division that provides bulk liquid, dry, and anhydrous ammonia fertilizers, chemicals, and seed. For your fuel needs please contact Southwest Kansas Cooperative Services LLC.